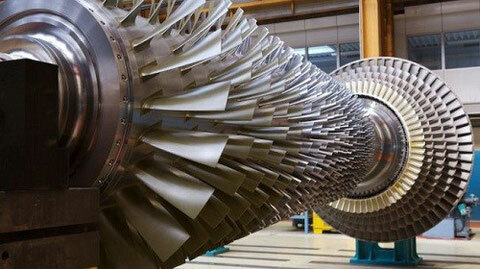 Turbine Management - De website van salvettifoundation! A power station needs to optimise output to meet demand, but inevitably there comes a time when maintenance repairs, either electrical or mechanical, will be required. While this may not affect the ability of the power station to meet current demand, it will place increased pressure on the remaining capacity, which in-turn needs to be robust enough to cope. Therefore, a programme of periodic, preventive maintenance can be combined with condition monitoring techniques to improve reliability. Employing a range of condition monitoring equipment, combined with suitable analysis techniques, can provide an accurate assessment of the status of turbines and generators, allowing operators to ensure continued production. One of the most useful tools is vibration analysis, which can indicate potential problems with bearings, and large rotating parts: thermal imaging is also used to identify potential issues with bearings, poor electrical connections or the imbalance of phase loadings - when combined, these can give an accurate indication of overall plant status. Additional testing of the electrical windings, especially partial discharge (PD) analysis, can provide useful information on the condition of the generator. PD can cause insulation degradation, which if not remedied, can lead to reduced output, and the appropriate use of condition monitoring provides an excellent maintenance tool for ensuring efficient generator output. Once a turbine and generator set is taken offline for maintenance, it is essential that repairs and upgrades are completed quickly, so planning and proper co-ordination of the various engineering teams is essential. The skills and equipment required for removing, repairing and commissioning a gas turbine are very different from those involved in the refurbishment of a generator coil and stator. Once a turbine has been removed, a reconditioning proposal need to be prepared. The ability to carry out weld inspection down to a microscopic level and provide accurate analysis of the balance of the turbine is important in determining potential areas for improvement. Checking that the turbine is in balance is crucial to ensuring that the plant operates free from vibration. Delivering high levels of maintenance is essential, meaning any potential issues must be repaired to precise standards using the appropriate techniques according to the specification of the turbine. Damaged turbine blades must be replaced, new bearings sourced and installed and the completed assembly carefully balanced to ensure smooth running once it is reinstated. In some cases the full extent of a repair does not become apparent until the generator is removed and examined closely. While the stator coils will usually be replaced, there may also be issues with the laminated core and rotor assembly. Modern insulation technology allows for thinner layers which can withstand greater dielectric stress and higher temperatures, and allows more space for copper within the same slot area. This reduces the resistance of the stator winding, which runs cooler, allowing a small increase in output. By using the latest CAD software, the bars or coils can be precisely formed to ensure an exact fit in the stator slot, making the installation process more efficient. By using comprehensive testing techniques, the reliability of the new coils can be guaranteed - especially important for coils being used in hydro-generators, which can be required to pass a 400 hour voltage endurance test as evidence of their build quality.